PRTG Network Monitor consists of three main categories: System parts, control interfaces, and a basic administration interface. This is the central part of a PRTG installation and includes data storage, web server, report engine, a notification system, and more. The core server is configured as Windows service which runs permanently. The part of PRTG which performs the actual monitoring. There are local probes, remote probes, and cluster probes available. All monitoring data is forwarded to the central core server. Probes are configured as Windows services which run permanently. Note: We assume that all computers on which the PRTG core server with its local probe or any remote probes run are secure. It is every administrator's responsibility to make sure that only authorized persons can access these machines. For this reason we highly recommend that you use dedicated machines for your PRTG system parts. The Ajax-based web interface is used for configuration of devices and sensors, as well as for the review of monitoring results. Also system administration and user management are configured here. A native Windows application as alternative to the web interface to manage your monitoring. With the Enterprise Console, you can connect to different independent PRTG core server installations and review their data at a glance! Monitor your network on the go with PRTG and apps for iOS, Android (including BlackBerry devices), and Windows Phone. Used to configure basic core server settings, such as administrator login, web server IPs and port, probe connection settings, cluster mode, system language, and more. In a cluster, the current master node is responsible for all of these tasks. Note: Core server and probe(s) are configured as Windows services which are permanently run by the Windows system without the requirement for a logged-in user. On a probe, PRTG performs the actual monitoring via the sensors created on a device (for example, computer, router, server, firewall). The probe receives its configuration from the core server, runs the monitoring processes, and delivers monitoring results back to the core server. On every system running a PRTG core server, there is always a local probe running on the same machine. The actual monitoring is performed by PRTG probe processes which run on one or more computers. During installation, the system automatically creates the Local Probe. In a single-probe installation—which is the default setup—the local probe performs all monitoring. The PRTG core server with the local probe inside the corporate LAN (bottom right in the figure above) is able to monitor services and servers in the entire Local Area Network (LAN). You can create additional Remote Probes to achieve monitoring of multiple locations, or for several other scenarios. 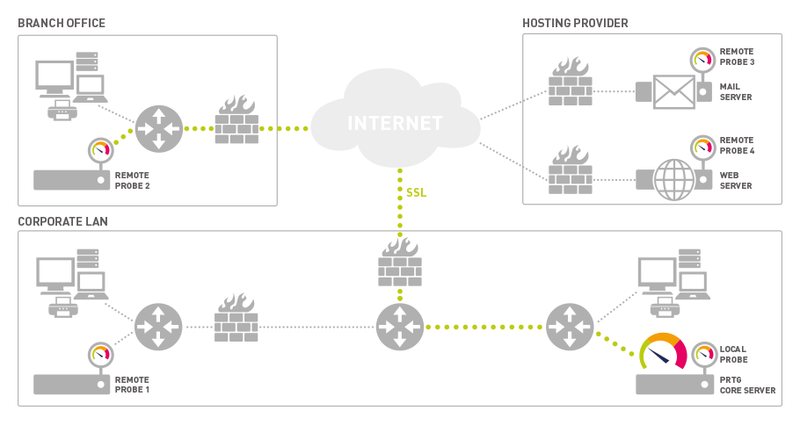 They use Transport Layer Security (TLS)-secured connections to the core and allow to securely monitor services and systems inside remote networks which are not openly accessible or secured by firewalls. For more information, please see Remote Probes and Multiple Probes. For an online tutorial of this see the More section below. PRTG Mini Probes allow you to create small probes on any device (not just on Windows systems). You can implement mini probes to gather monitoring data exactly like you need it and create them on any platform. For more information, see the Mini Probe API definition in the PRTG web interface (see section Application Programming Interface (API) Definition). We recommend that you keep these sensors, but you can optionally remove all except the Health sensors. They measure various internal system parameters of the probe system hardware and the probe's internal processes and computes a resulting value. Frequent or repeated values below 100% should be investigated. Please check the channels of a particular sensor for details.